I was making art every day, writing poetry for the first time since I was a teenager, taking photos with my Mamiya. I was taking a flamenco class and got myself memberships to SFMOMA and the SF Ballet. I was reading and writing letters on paper to my brother who was in college. All of it was brewing something exciting, though I wasn't sure exactly what it was at the time. I had an unreal day job that was a dream for anyone who was ok working in an office, but I was growing impatient with the 9-5 and yearned to keep my hands working on something with a different meaning. I took some time to go to Portland and make art with my brother, and one morning we decided we'd make a zine. We'd name it after his poem he had just read me: Will You Be My Electric Blanket. The zine was in our heads for maybe a few days before the lightbulb illuminated the part of me that had been trying so hard to escape. It was time to quit the comfort of my career and open a vintage shop and art gallery, and I'd call it Electric Blanket. It would be a place where I could workshop ideas and art and creative events. There would be coffee and a big table and people would be encouraged to build on installations that would evolve with the space. In practice, it was many things. It was a dream come true- it was everything I imagined and more. 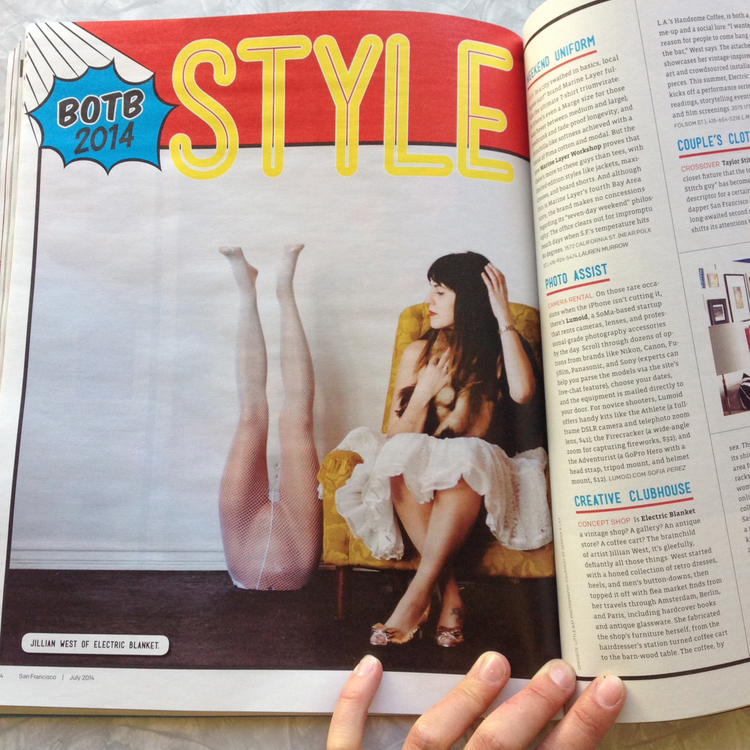 It was received with the most stellar press, including Best of the Bay for Style. I imagined I'd do it forever, though the reality soon settled in: running a shop and dealing with the public meant I had less and less time for the art I wanted to do, and less and less time or energy to see all of the ideas come to life. In retrospect, it was a huge project to undertake without a business partner or team of likeminded people dedicated to supporting it all. In retrospect, it would have been worthwhile to spend more on rent to be in a safer neighborhood where the employees I hired didn't have to risk their lives to work for me. I learned a lot, and I'm beyond grateful that I had the chance to both open and close the project of my dreams. I have a feeling there will be a future iteration one day, but until then here are some archives from our old website. You can also find us on Etsy HERE.